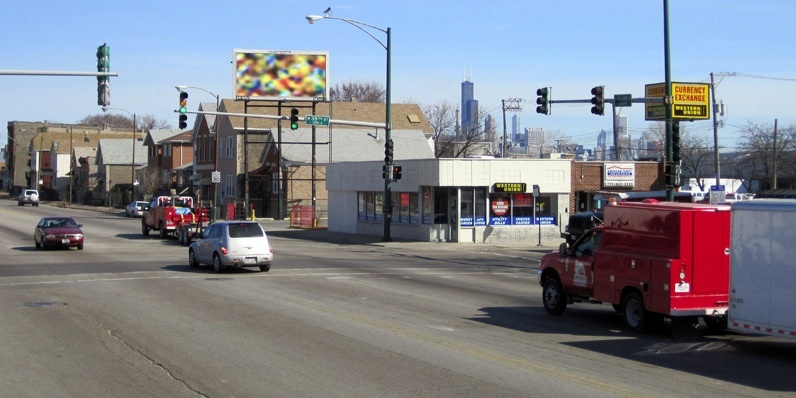 Three new billboards on the South and West Sides of Chicago wordlessly announce the coming spring. Each billboard frames a shock of fuzzy colors, like Abstract Expressionist paintings in the sky. Artist and art-book publisher Doug Fogelson, who has previously worked on public art commissions, this time wanted to create a direct and immediate public action without the restrictive layers of committees and grants. The billboards went up April 8 and they’ll be viewable for one month. Fogelson sited his abstractions at busy intersections in the Humboldt Park (at Chicago and Spaulding), McKinley Park (at 35th and Ashland) and Washington Park (at 63rd and State) neighborhoods, places he calls “some very rough zones in the city.” The communities living here must too often content with gang violence, drug dealing and a decaying industrial landscape. Will the billboards ameliorate some of these difficulties? “I have seen art and artists positively impact communities both directly and indirectly,” Fogelson says, speaking mostly of his experience with art education in schools. “However, I have no illusions that the effect will be very substantial here.” As public art, the billboards, like graffiti, subvert the expected streetscape. “If this work takes peoples’ minds off the mundane or challenging aspects of life for a moment then it succeeds,” says Fogelson.